And yet the words return. At the conference at UBC I had the pleasure of attending a few weeks ago, participants worked to answer the question of what might come next for Canadian and environmental studies now that constructivist critiques of wilderness and the nation have become commonplace in the academy. Participants had a variety of ideas: pay attention to plants, for they have culture too, and plans of their own; recognize the limits of human knowledge, and allow for the unknowable; and talk about land instead of nature, for the struggle takes place there. These are humble beginnings, certainly, beginnings that contain the recognition that humans do not have sole claim to agency, that the quest to know the world fully is misguided and arrogant, and that some people’s wilderness requires other people’s dispossession. Humility: openness to change, to learning other ways of knowing, to being transformed by the process. I went to the conference looking for answers. After having finished a project that examines the history of wilderness, which shows how the creation of a Canadian wilderness depended on the material and discursive eviction of the Teme-Augama Anishnabai from their homeland, I wanted to know what to do next in my research. In working on the project, I was struck by the consistency and persistence of the First Nation’s claim to their territory. Once I started to look, I found hundreds of instances over time of Teme-Augama Anishnabai calling for non-Aboriginal governments to stop their citizens from encroaching on the First Nation’s lands and disrupting the band’s ways of life. It became clear to me that the Canadian wilderness was and remains a colonial construct implicated in the dispossession of First Nations and in the naturalization of that dispossession. I concluded that, without wilderness, which never really existed anyway, we have only relationships, relationships among different groups of people and between people and land, relationships that have historically not worked, particularly for the Aboriginal peoples and non-human world who have paid the greatest price for the western separation between nature and culture. But what comes next? The work of taking apart concepts such as wilderness only carries us so far (and by “us,” I mean people engaged in this work, be they environmental historians or not). It leads us to where Aboriginal groups began, to the place where we do not take wilderness as a given location “out there,” but understand it as a concept imposed upon Aboriginal peoples by others as part of a very real contest over land. At its most promising, this taking-apart work opens space for other ways of imagining, for new kinds of relationships. The conference did not give me answers, but the ideas of others did provide me with the confidence to take heed of those pesky words, to trust that in following them I will find a good path, and to understand that humility requires uncertainty and risk. 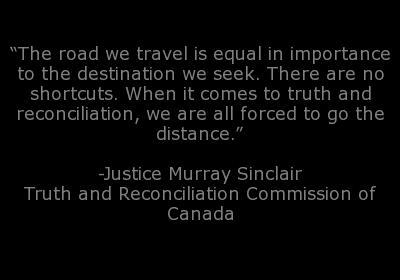 And so I find myself drawn to the ongoing Truth and Reconciliation Commission on residential schools for Aboriginal people in Canada (not to be confused with the proposed post-Lance-Armstrong’s-fall-from-grace Truth and Reconciliation Commission on the sport of cycling… Really?!). Canada’s Truth and Reconciliation Commission aims not only to reveal the previously buried history and ongoing legacy of church-run residential schools, but also to guide a process of reconciliation within Aboriginal families and between Aboriginal peoples and non-Aboriginal Canadians (see www.trc.ca/websites/trcinstitution/index.php?p=4). The long-term result, the Commission hopes, will be relationships based on mutual understanding and respect, relationships that cannot coexist with the learning that took place both within residential schools and in Canadian society as a whole that taught Aboriginal inferiority and white settler superiority, thus supporting colonialism. I find myself compelled by the Commission because it addresses relationships head-on, is in fact all about relationships. I notice too as I read through the Commission’s interim report, published earlier this year, that those words crop up in it again and again, especially the word “witness.” Members of the public are encouraged, for example, to attend regional hearings and thus “bear witness to the truth being shared.” Perhaps bearing witness represents potential for a different way to do historical research on human-environment relationships. I do not fully understand what it means to be a witness, or to do the act of witnessing, but in its requirement of being present, paying attention, and being open to the possibility of transformation through practice, witnessing seems a promising, and humbling, place to begin to forge different kinds of relationships among Aboriginal peoples, non-Aboriginal peoples, and the land we need to learn to share. I look forward to coming to understand what on earth I mean by this! Thank you to Beverley Diamond and Siphiwe Dube for taking the time to provide me with their insights on the Truth and Reconciliation Commission. They have given me much to ponder. Jocelyn Thorpe is an assistant professor in women’s and gender studies at the University of Manitoba. Jocelyn Thorpe is an associate professor in Women’s and Gender Studies at the University of Manitoba in Winnipeg, Canada. Her interdisciplinary research focuses on the history and legacies of, as well as challenges to, colonialism in the Canadian context, examining how past discourses and relationships of power influence the present. With Innu artist Joanna Barker, she is currently working on a five-year project about the history of relationships among Indigenous and non-Indigenous Newfoundlanders and the territory they have come to share. She is the author of Temagami’s Tangled Wild: Race, Gender, and the Making of Canadian Nature (UBC Press, 2012) and coeditor with Stephanie Rutherford and L. Anders Sandberg of Methodological Challenges in Nature-Culture and Environmental History Research (Routledge, 2017).